Fibromyalgia and chronic fatigue syndrome can affect every area of your life, right down to the most ordinary tasks of daily life. Sometimes, you might be surprised by how difficult so-called ordinary things have become for you. It's such a basic thing – you get up, shower, style your hair, and make yourself presentable before you go out into the world. Right? For us, it's not that simple. Fortunately, there's a simple solution to this: baths. They eliminate many of the problems. Then there's styling your hair. Holding your arms up to brush, blow dry and flat iron is hard on the arms. 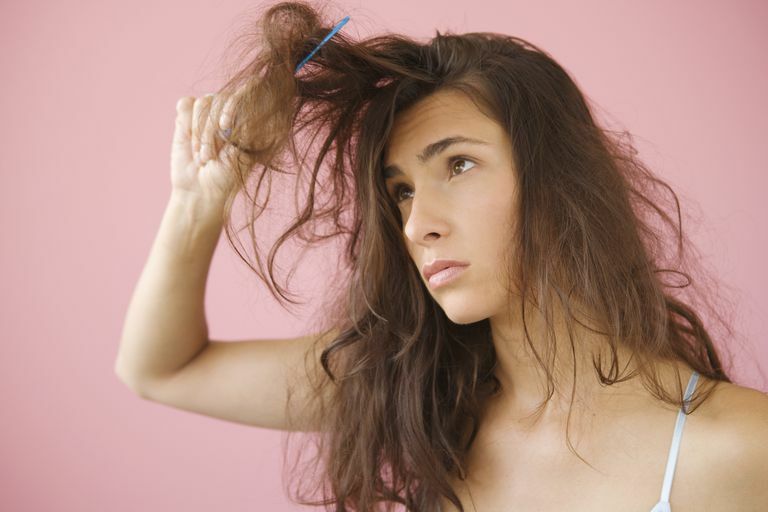 For the heat sensitive, styling tools can make you feel like you're in a microwave, especially after a hot shower. In some of us, they can also trigger excessive sweating, which can undo all that hard work, and melt off your makeup, just minutes after you're done. Waistbands. Bra straps. Elastic in socks. Rough fabrics. Tags. These are all things that can cause a lot of pain because of allodynia. Many of us have to tailor the way we dress to avoid this symptom, or to at least make it less of a problem. Temperature sensitivity can play a big role here, too. What starts out as a cozy sweater on a cold day can become a sweltering nuisance if the heater's set too high. A cool breeze can quickly make you regret a pair of shorts and a light cotton shirt as well. Get tips: Dressing for Less Pain. We don't normally think of a conversation as a strenuous mental activity, but when you have cognitive dysfunction (brain fog or fibro fog), it can become one. All social interaction takes energy, and when you're not face-to-face, it takes even more. A big part of communication is body language, and you lose that when you're on the phone. That means you have to focus more. For most people, it's not noticeable. For us, though, it definitely can be. Our foggy brains might not be up to the task at times. Also, when you're on the phone, you may be distracted by things in your environment that the other person is unaware of. Many of us have problems multi-tasking, so your brain may essentially block out what the other person is saying while your attention is on something else. Then you find yourself confused as to where the conversation has gone, which can be frustrating and embarrassing. Many of us have problems with language, especially when it comes to finding the right word for things. Again, it's frustrating and embarrassing, and if you know you're having a bad day, communication-wise, it can be easy to stress over the problem and make it worse, or at the very least make the conversation unpleasant for you. And then there's the physical aspect. Holding a phone for very long can tire your arm, or your neck if you're clenching it between your jaw and shoulder. For some tips on dealing with this issue, see: Hating the Telephone With FMS & ME/CFS. Brain fog can be a major problem when you're behind the wheel. Some of us periodically forget where we're going or how to get there. Even worse, we may become disoriented and not know where we are. It's scary when this happens and can lead to an anxiety attack, which makes the situation even worse. Most of the people with these illnesses stay able to drive. Some may have to limit their driving to familiar places, while others are okay most of the time but choose not to drive on especially bad days. A few decide it's best for them not to drive at all. It's a personal decision, but one that we need to be aware of to protect ourselves and others. As you evaluate your driving ability, it may help to get input from friends and family members who've ridden with you, as they may have noticed things you didn't. For more on driving, see: Brain Fog & Driving. For help getting started, see: 10 Important Lifestyle Changes.